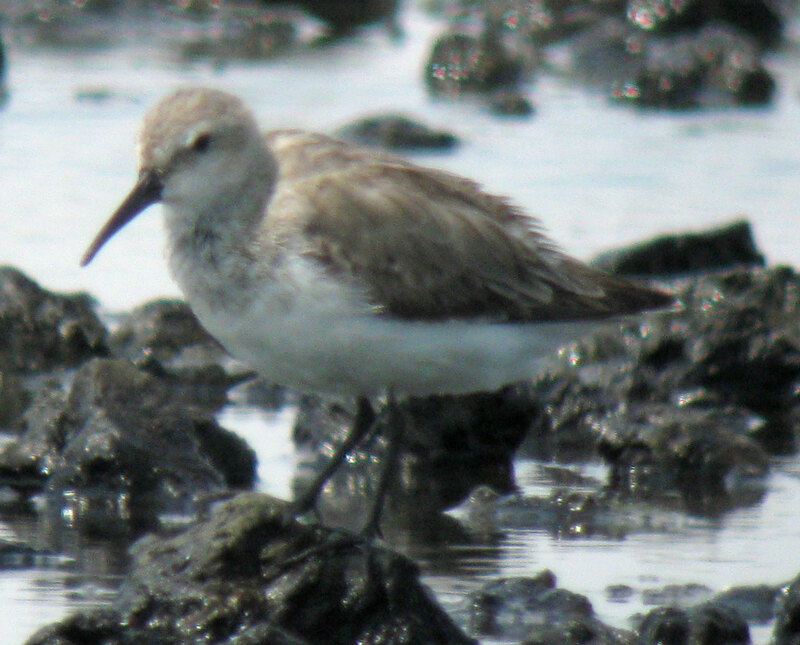 I recently posted about an apparent hybrid sandpiper in Thailand. A few days earlier on the same trip (7 Feb 2010) I had seen another odd sandpiper that didn’t fit any known species. As I’ve worked on this post I feel safe ruling out Curlew Sandpiper, and the only things wrong for Dunlin are the fine-tipped bill and my impressions at the time that it was small and unusual. It’s possible that this one is also a hybrid, although I lean towards an odd Dunlin. A few photos are below, more can be seen in a Picasa gallery here. 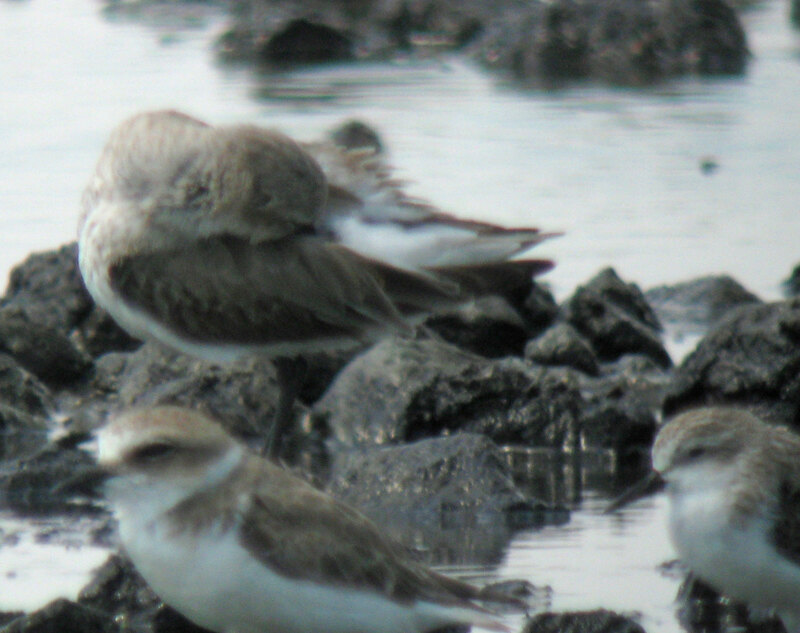 Unidentified sandpiper (back left) with Kentish Plover and two Red-necked Stints, Laem Pak Bia, Thailand, 7 Feb 2010. Dunlin-like but smaller with very fine-tipped bill, paler than normal plumage. Note that the wingtips are slightly shorter than the tail tip.Photo copyright David Sibley. When I first spotted it, roosting with a flock of Red-necked Stints and plovers, it struck me immediately as something odd. It was smaller, stockier, and shorter-billed than the numerous Curlew Sandpipers in the area (none of which were roosting with stints), and my first thought was that it was a Dunlin of one of the smaller subspecies. I was able to take a few marginal photos before the whole flock took off together and headed out to their low tide feeding areas. Unfortunately I could not pick it out in flight, and did not hear any flight calls. Given that there are features of structure and plumage that seem to rule out Curlew Sandpiper and argue against Dunlin, a hybrid seems like a possibility, but I can’t think of any combination that would look so much like Dunlin without being one. The paleness might be a separate anomaly, such as leucism (or maybe it’s just very faded and worn). In hybrids involving a dark-rumped species and a white-rumped species (Pectoral Sandpiper x Curlew Sandpiper or Dunlin x White-rumped Sandpiper), the area of dark is reduced, but the dark color remains the same. 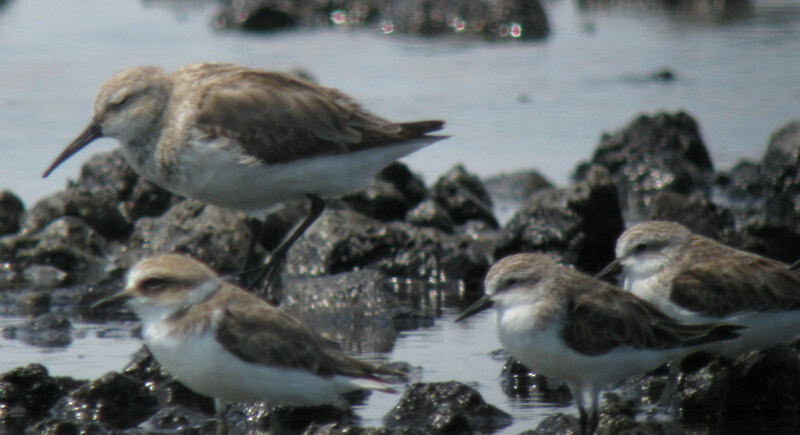 So maybe this bird is a short-winged, runt, dark-rumped Curlew Sandpiper, or maybe a slender-billed Dunlin. I just don’t know what to make of it. I know there’s not much to go on here, given the brief observation and low-quality photos, but maybe someone else has seen a similar bird. Any comments and discussion are welcome. Unidentified sandpiper at Laem Pak Bia, Thailand, with Kentish Plover and Red-necked Stint, 7 Feb 2010. The line of dark feathers can be seen along the rump, continuing to the dark central uppertail coverts, which rules out Curlew Sandpiper, although these feathers seem a bit paler than I would expect on a Dunlin? Not again that the wingtips do not reach the tail tip, unlike Curlew Sandpiper. Photo copyright David Sibley. Unidentified sandpiper at Laem Pak Bia, Thailand, 7 Feb 2010. Photo copyright David Sibley.